ANCHORAGE, Alaska — An Alaska petroleum industry trade group has sued the federal government over its designation of 187,157 square miles as polar bear critical habitat, claiming it covers too much territory and could cost tens of millions or more in economic effects. The Alaska Oil and Gas Association sued Tuesday in Anchorage. “This is an area larger that 48 of the 50 states, exceeding the size of the State of California by nearly 25,000 square miles,” association attorneys said in the lawsuit. The designation is unprecedented – the largest area set aside in the history of the Endangered Species Act – and was done for an animal that is abundant, with 20,000 to 25,000 animals in 19 subpopulations, according to the group. AOGA represents 15 companies that account for most oil and gas exploration, production, refining and marketing in Alaska. The group claims there is no evidence of an overall decline in the global polar bear population or its historical range. That’s disputed by the Center for Biological Diversity, which petitioned to list bears. “AOGA’s suit is premised on the fiction that polar bear populations are stable,” said attorney Brendan Cummings in an e-mail. The two best-studied populations, western Hudson Bay and Southern Beaufort Sea, are known to be declining, he said. The polar bear specialist group of the International Union for Conservation of Nature lists eight of the world’s 19 subpopulations of polar bears as “declining,” including both of Alaska’s. Seven other subpopulations are listed as “data deficient” for making the call. A U.S. Geological Survey model prepared before the listing suggested a better than 50 percent chance that polar bears will be extinct in Alaska’s Beaufort and Chukchi seas under the minimum sea ice model run by 2030. The USGS later noted its projections of sea ice decline appeared to be underestimated. 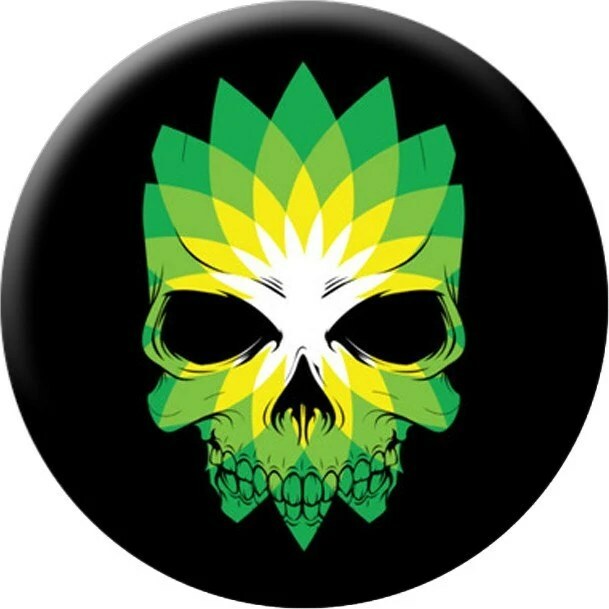 JUNEAU, Alaska — BP PLC estimates that it could begin producing oil off Alaska’s coast in 2013, despite the fact that construction of the massive Liberty rig has been suspended indefinitely. BP said last fall that it was suspending construction of the rig to review its engineering and design plans, and ensure the Liberty project can be done safely. The unusual project calls for using a manmade gravel island in the Beaufort Sea as a drilling base. A rig would drill horizontally for six to eight miles to tap what BP estimates is a 100-million-barrel reserve of recoverable oil. BP Alaska spokesman Steve Rinehart says the project review is progressing but he couldn’t say when it would be complete or when construction would resume. Although the Cold War ended in 1991, the U.S. and Canada still maintain a string of radar stations from Alaska to Greenland. The system, originally called the DEW (Distant Early Warning) Line, was built in the 1950s, to detect Russian bombers or reconnaissance aircraft coming in. Right across the Arctic Ocean, and the North Pole from the northern coast of North America, is the north coast of Russia . Right across the pole is the shortest distance (for aircraft or ballistic missiles) from Russia to North America. After the Cold War ended, Canada took over control of the entire system, which is now managed from an underground facility in Ontario. The U.S. still picks up 60 percent of the cost, and has access to information the radars collect. Even as the Cold War was ending, the DEW line was already being replaced by a system consisting mostly of unmanned radar stations (which cut operating expenses 50 percent and spared many Canadian and American air force personnel periods of duty on the coast of Arctic Ocean). The new North Warning System (NWS) consists of 15 manned long range radars (11 in Canada), and 39 unmanned radars (36 in Canada). This radar system covers an area 5,000 kilometers long and 300 kilometers deep. The DEW line was much longer (going from the Aleutian Islands to Iceland) and deeper (there were two more radar lines farther south, north of the U.S. border. The DEW Line and the NWS give no warning of ballistic missile attacks, so a different system, using ground and space based radars, has been developed over the last half century. But you still want to know what aircraft are out there over the cold Arctic seas. A civilian firm provides most of the logistic and technical services to maintain the radars, their generators and communications equipment of the NWS. This costs about $63 million year. The unmanned radars are marvels of automation, built with many redundant systems, so the radars can remain operational until maintenance crews can be flown in from one of the five support bases. This is particularly difficult during the long, cold and dark Winters. STEPHANIE AGUVLUK / The Associated Press Eskimo whalers wear float coats on the Chukchi Sea north of Wainwright. The whale hunters have traditionally worn white as camouflage, forgoing the use of life jackets because they've been unavailable in white. When the whaling season arrives this spring hunters from 11 coastal villages will wear the white float coats. Gordon Brower has been hunting bowhead whales for most of his 47 years, forgoing life jackets because no one made them in white, the only color that would work as camouflage on Alaska’s icy Arctic coast. When the subsistence whaling season arrives this spring, more Alaska Native hunters from coastal villages will be outfitted with the white float coats being distributed through a safety program that’s been greatly expanded since its debut last year. A couple dozen whalers also will receive white float pants. Brower’s crew was among whalers who tried the coats last year. On the first trek out with the new gear, the crew landed a 30-ton bowhead. The coats are the result of efforts by the Coast Guard, the Alaska Native Tribal Health Consortium and Burnaby, British Columbia-based Mustang Survival Corp., which makes flotation and extreme climate protection products. The whalers’ coats have a nylon shell and flotation foam filling, which also offers protection against the frigid conditions faced in the Arctic. Mike Folkerts, a recreational boating safety specialist with the Coast Guard, was participating in a mission to Barrow in 2009 when he noticed the town’s main grocery and general store had no life jackets for sale. Local whalers told him life jackets were too bright and would scare away the animals. He asked if they would wear the jackets if they were available in white. Folkerts called a couple companies, including Mustang, that sent prototype samples, which Folkerts showed to the whalers.”They loved them,” he said. There is no federal or state requirement to wear a life jacket in a recreational boat unless the person is under 13, although life jackets on board are required, he said. But Brower has seen his share of tipped boats over the years. He points out that his boat is only 24 feet long, while whales can be more than twice as long, averaging a ton per foot. As far as Strayer is concerned, whalers are role models. She’s hoping they inspire others to start wearing life jackets. For the upcoming spring whaling season that begins in April when bowheads are heading north, the consortium is distributing 96 coats among crews from the remaining villages that are members of the Alaska Eskimo Whaling Commission, which represents 11 communities. Four crews, including Brower’s, will get the float pants. The funds for this year’s effort came from a $15,000 donation from Shell Oil and almost $11,000 from Conoco Phillips, an oil producer on the North Slope, where some of the whaling villages are located. Shell has offshore oil exploration projects in the region. 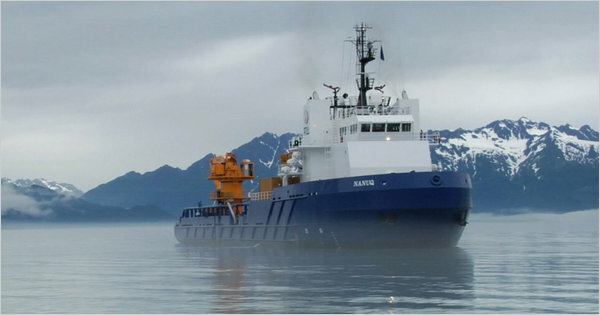 The Nanuq is part of Shell’s Arctic oil spill response fleet, which would be ready 24 hours a day. HOUSTON — Eager to win approval for its stalled plan to drill for oilin the Alaskan Arctic, Royal Dutch Shell is beginning a public lobbying campaign, including national advertising, on Monday. As part of the effort, the giant oil company is promising to make unprecedented preparations to prevent the kind of disaster that polluted the Gulf of Mexico earlier this year. In response to the gulf accident, the Obama administration suspended most new offshore drilling, including in the environmentally sensitive waters of the Arctic. But now that the moratorium on gulf drilling has been lifted, Shell is pressing the Interior Department to grant final approval for its Arctic projects by the end of this year so that the company has enough time to move the necessary equipment to drill next summer, when the waters offshore are free of ice. “Every day we’re delayed, we’re delaying jobs and energy development,” Peter Slaiby, Shell’s vice president for Alaska, said in an interview. The gulf disaster raised public and government awareness of the risks of catastrophic spills from offshore wells. The waters off Alaska are considered particularly tricky because of the long periods of daytime darkness, periods of months when ice would block the movement of relief ships and the fragility of ocean habitats for whales, polar bears and other species. “We are opposed to drilling until we get sufficient science that demonstrates that you can do it truly safely,” said Chuck Clusen, director of the National Parks and Alaska projects at the Natural Resources Defense Council. Shell said its emergency response plan was far more robust than the one BP had in the gulf. Shell is beginning a public lobbying campaign, including national advertising, next week. The company’s plan to drill in Alaska’s Beaufort and Chukchi seas has been snarled in regulatory delays and lawsuits for four years. Shell’s new marketing campaign promotes an “unprecedented spill response approach” including a sub-sea containment system, an upgrade of the drilling rig’s blowout preventer and an enhanced response plan that include teams and equipment at the ready 24 hours a day. The containment system would include a dome that could be placed over any leak, and a funnel to take any escaping oil to surface ships. A rig would be at the ready to drill a relief well if needed. Shell has also scaled back its initial drilling plans to just one or two wells in the Beaufort Sea. It is postponing drilling in the more remote Chukchi Sea pending separate legal challenges. The company has the support of Alaska’s state government, which is suing the federal government to overturn the drilling suspension. Gov. Sean Parnell said the suspension was illegal because the Interior Department did not consult with state officials or consider the local economic consequences. A federal district court judge in Alaska gave the Interior Department a deadline of Friday to respond to the Alaska suit, with a hearing planned for the end of the month. The Justice Department responded Friday night with a filing that argued that the state did not have standing to sue in the matter, and that the Interior Department was in the process of considering the application. “We are taking a cautious approach,” said Kendra Barkoff, an Interior Department spokeswoman. 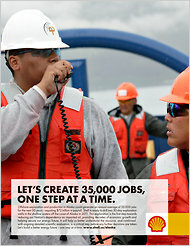 Shell’s campaign appears aimed at increasing pressure on the Obama administration to approve the plan. The company is placing ads for the rest of the month in national newspapers, liberal and conservative political magazines and media focused on Congress. For Shell and others in the oil and gas industry, nothing less than the revival of Alaska’s oil history is at stake. Alaska is the second-biggest oil-producing state after Texas, but it has suffered a steady production decline since 1988, when output peaked at 2.1 million barrels a day. With its North Slope fields long past their prime, the Arctic National Wildlife Refuge off-limits to drilling and offshore wells largely untapped, the state today produces about 680,000 barrels a day and the Trans-Alaska Pipeline System is running at one-third of capacity. To make matters worse, the United States Geological Survey last month cut previous estimates of oil reserves in Alaska’s National Petroleum Reserve, an area preserved by the federal government in case of national emergency, by about 90 percent, to 896 million barrels, approximately what the country consumes in six weeks. Industry officials say there are as many as 25 billion barrels of oil reserves in the Alaskan Arctic. At the moment, there has been no offshore drilling in Alaskan federal waters since 2003, although there is some production from older wells. Companies wanting to drill face heavy drilling costs, local opposition and legal challenges from environmental groups that say a potential blowout could endanger critical feeding and spawning grounds for a variety of Arctic species and warn that rough Arctic seas would complicate any containment and cleanup operations. Mr. Clusen of the resources council noted that a blowout at Shell’s project would cause a slick on barrier islands that are critical birthing areas for polar bears in the winter. Shell hopes that Chukchi Sea leases it acquired for $2.1 billion in 2008 could eventually produce as much as 400,000 barrels of oil a day. The holdings in the Beaufort Sea are probably less bountiful, but could eventually produce as much as 100,000 barrels a day. Shell executives insist that drilling in Arctic waters is safe. They say they will be drilling in 100 to 150 feet of water in the Beaufort Sea, compared with depths of 5,000 feet and more in the gulf, which means that the equipment will be subject to far less pressure. A version of this article appeared in print on November 6, 2010, on page B1 of the New York edition. A $40 million Alaska Native collection is debuting in Anchorage this month, representing a homecoming for 600 rare objects, most of which have never before been seen in public, much less touched. 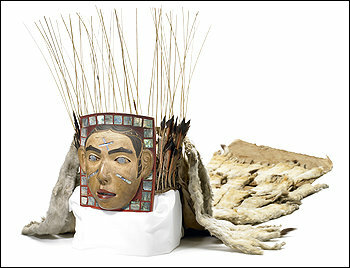 The new Smithsonian Arctic Studies Center at the Anchorage Museum, opening May 22, will display clothing, baskets, masks, weapons, utensils, drums, games and more in a first-of-its kind permanent loan arrangement between the Alaska museum and the Smithsonian. 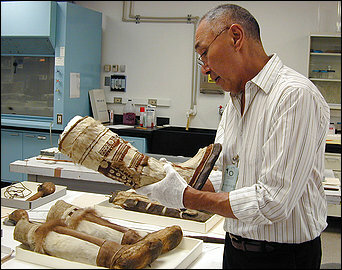 As part of the unusual agreement, some Alaska Native community members such as Ongtooguk, one of the consultants on the project and an assistant professor of education at the University of Alaska at Anchorage, will be allowed to remove the objects, with assistance from curators, for further study and interpretation. The artifacts come from the National Museum of Natural History and the National Museum of the American Indian, where they’ve mostly been in storage. The initial agreement commits them to the Alaska museum for seven years. In choosing the objects, which represent nine native cultures across the state and date mostly from 1850 to 1900, Smithsonian anthropologists examined about 30,000 items in Washington. The effort was headed by Aron Crowell, director of the Arctic Studies Center, who has represented the Natural History Museum on the project since 1994. It was a daunting task, Crowell said when I interviewed him in Anchorage. But he and his colleagues had help. Beginning in 2002, 40 native elders, artists and educators, chosen by regional Alaska native organizations, made seven weeklong trips to Washington to go through thousands of items. Hundreds of other Alaska natives also had input into the project. The participants were videotaped telling stories about the objects and describing the memories they brought back, and these videos are part of the exhibit, which is called “Living Our Cultures, Sharing Our Heritage: The First Peoples of Alaska.” The videos will run continuously on large screens throughout the 10,000-square-foot, second-floor gallery space in the Anchorage Museum’s new wing, part of a $106 million expansion at Alaska’s largest museum. Crowell enthusiastically showed off the new space on a cold day in February. The delicate shipments had not yet arrived from Washington, but glass cases — specially designed with armlike mounting brackets so that items can be removed and carted to a study area — were in place and had him gleeful. Alaska native artists, elders, historians and others with expert knowledge will have access to the objects by appointment. Webcasting will allow those in remote locations to witness their interpretations of the items. “This is not hands-off, and kept behind glass. It’s a community resource and study collection, and we are thrilled to make use of it in that way,” Crowell said. “That took a lot of negotiation.” Many of the objects are fragile, and some needed repair before they could be exhibited. Visitors to the gallery will see a short introductory film before viewing the displays, which are arranged geographically from the Tsimshian people in the southeast to the Iñupiag people in the north. Hands-on interactive screens similar to those at the American Indian museum will allow visitors to zoom in on the objects and to get more detailed commentary. In a far corner, an audio gallery, the Listening Space, will run a cycle of stories told in English and about 20 native languages. Ongtooguk said that for many of Alaska’s more than 100,000 indigenous residents, the objects in the exhibit are already family. Crowell said that many of the other pieces also have deep meaning. A parka made of seal gut, from the Yupik people of St. Lawrence Island in the Bering Sea, for instance, evoked from elder Estelle Oozevaseuk a story about the village of Kukulek, lost in an epidemic and famine in 1878-80. A recording of the story in both Yupik and English will play for visitors in the Listening Space. The Arctic Studies Center at the Anchorage Museum, 625 C St. Open 9 a.m. to 6 p.m. daily, May 22 to mid-September, closed Mondays other times of the year. $10, $8 seniors, students and military, $7 ages 3 to 12. One of Canada’s top archaeologists argues in a new book that the prehistoric ancestors of this country’s 55,000 Inuit probably migrated rapidly from Alaska clear across the Canadian North in just a few years — not gradually over centuries as traditionally assumed — after they learned about a rich supply of iron from a massive meteorite strike on Greenland’s west coast. The startling theory, tentatively floated two decades ago by Canadian Museum of Civilization curator emeritus Robert McGhee, has been bolstered by recent research indicating a later and faster migration of the ancient Thule Inuit across North America’s polar frontier than previously believed. Now, in a just-published volume of essays by some of the world’s leading Arctic archeaologists, Mr. McGhee advances his theory — a 4,000-kilometre beeline quest for iron from Greenland’s famous Cape York meteorite deposit — as the likeliest explanation for the sudden spread of the Thule culture across Canada around 1250 AD. “Current evidence increasingly suggests that the concept of a relatively slow, environmentally driven Thule Inuit expansion across Arctic Canada, beginning around AD 1000, is no longer viable,” Mr. McGhee writes in The Northern World: AD 900 to 1400, a newly released book he co-edited with two U.S. scholars. Instead, he argues, new radiocarbon data and other reassessments of Eastern Arctic archeaological sites suggest the Alaska-based Thule undertook an epic voyage by skin boat and dogsled — almost directly from Alaska to Greenland, and within a few summer travelling seasons — about 750 years ago. Significantly, Thule Inuit archeaological sites near the Cape York deposits are older than others in Canada closer to Alaska — further suggesting an initial dash to the northeast Arctic followed by a more gradual dispersal of population groups throughout present-day Nunavut, Northwest Territories and Yukon. Mr. McGhee believes the Thule Inuit had learned about the valuable metal at the Cape York meteorite field from contact with Canada’s aboriginal Dorset people, who were already using iron and trading it with Norse sailors from southern Greenland and Iceland. “It would seem plausible to suggest that metal — meteoric iron from the Cape York meteorites and metal goods traded from the Norse — may have been the magnet that drew ancestral Inuit eastward from Alaska,” Mr. McGhee contends. He adds that this interpretation of Inuit origins in Canada — as resulting from “commercial motives” and “mercantile exploration” — challenges the prevailing view that ancient native cultures would only migrate to new territories incrementally and in response to environmental pressures, dwindling food supplies or competition from rival peoples. “We may have been led astray by the deeply rooted archeaological tendency to ascribe different sets of motives and different cultural processes to aboriginal peoples than we apply to Europeans or other societies with a written record of individual accomplishment,” Mr. McGhee concludes. “Future archeaological work may indicate that ancestral Inuit may be more accurately viewed as an entrepreneurial people” driven by the same kinds of economic opportunities that prompted such explorers as Christopher Columbus, John Cabot and Jacques Cartier to sail for the New World centuries later. Mr. McGhee, who lives near Ottawa, told Canwest News Service on Monday that the Thule Inuit used iron for weapon points but also to carve the antler and bone implements central to their technology and culture. The apparent target of the Thule Inuit’s suspected race for Arctic resources — reminiscent of the current “rush” for polar oil by Canada and the four other Arctic coastal states — was the series of enormous nickel-iron space rocks that crashed to Earth in northwestern Greenland unknown millennia ago. The Dorset people — a “paleo-Eskimo” culture that disappeared from the Canadian Arctic when the Thule Inuit arrived — are known from archeaological investigations to have used Cape York meteoric iron for centuries. But it wasn’t until the 1890s that U.S. Arctic explorer Robert Peary first documented the meteorites and arranged for the transport of several large specimens to the American Museum of Natural History in New York, where they are still on display.